As a child growing up in the Doolittle household, I was relatively unaware of the public personas of my grandfather Jimmy Doolittle and my grandmother Joe. To me, they were simply Granny and Gramps, and their home was Doolittle Central, a place of unconditional love and laughter. As I matured, I learned about the public image of the general and the woman he called Duchess. I heard stories of the daredevil pilot who achieved numerous aviation firsts, of the scientist driven to expand the horizons of aviation and the general who asked only of his men what he himself was willing to give. I saw firsthand his insatiable thirst for knowledge and self-discipline, his sense of humor and his charm, his keen observations and his honesty and fairness. He claimed that the luckiest thing that ever happened to him was when my grandmother agreed to marry him. I think that's true. My grandmother had the patience of a saint. She stood by him throughout his life, usually beside him, but occasionally prodding from behind and sometimes in the lead. She was gentle, kind, intelligent, loving, and equally determined. They lived through extraordinary times of great change. Early in his career, Jimmy Doolittle was branded a daredevil pilot who would try anything in an airplane-a reputation that was reinforced by his devil-may-care attitude when dealing with the press. But in truth, he was blessed with an analytical mind and most of his "stunts" were the result of careful study and planning. He was the master of the calculated risk. There were those who claim that the Tokyo Raid was a suicide mission. This is not true. Although it was dangerous, the planning and execution of the Raid were based on calculation and study. Every man on that mission had reason to believe that he had a good chance of returning home safely. The Tokyo Raid was a calculated risk. In her own way, my grandmother was also a master of the calculated risk. An "A" student with an equally analytical mind, she gambled early on a boy who boxed for spending money and fancied finding gold on the beaches of Alaska. She traipsed around the country, pulling up stakes and replanting them every time Jimmy's career led them in a new direction. Never once did she stand in his way. I would never claim that my grandfather's success was because of my grandmother, but I believe she made success easier for him--that his achievements were also her achievements. She was the good woman behind the good man. He was best known for leading the Tokyo Raid, but the raid was not what he felt was his most important achievement. He firmly believed that his experiments, especially in blind flight, were his greatest contributions. Although many of the books written about my grandfather mention my grandmother, this is the first book that tells her story, too. This is their story, the story of their partnership. He was in the public eye. She was his rudder and the "wind beneath his wings." Calculated Risk is a biography, journal of historical events, memoir and love story. When Josephine Daniels met "that Doolittle kid," he was a scrappy young fellow with little interest in high school. Together they created a future that would span more than seven decades. Decades that witnessed aviation records set, broken and reset. Decades that spanned two world wars. 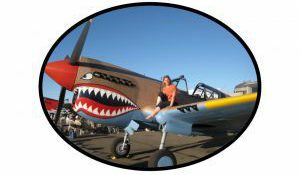 Decades that fostered the development of both military and commercial aviation. Decades that gave birth to the U. S. Air Force as an independent branch of the military services. Calculated Risk is a window into the public and private lives of Jimmy and Joe Doolittle as world citizens, parents and grandparents. I relied in part upon his autobiography, and books by Carroll V. Glines. I read my grandfather's wartime letters to my grandmother, plus hundreds of letters sent to them over the years. But most of all, I drew from the stories my grandparents told us, my father's recollections and my first-hand memory of the people I knew as Granny and Gramps. As time moves on and takes with it those who lived history, our memory dims and their stories fade. 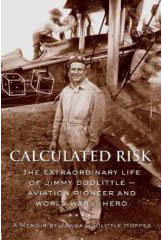 Calculated Risk is my attempt to pass to a new generation the story of Jimmy and Joe Doolittle, and to keep our collective memory alive for at least a little longer.